Set up a machine to install the management console software to evaluate the installation and configuration process. refer to your installation documents to ensure that the product is correctly installed and configured. Pick a sample of the different types of machines that you manage (e.g., Windows 7 workstations, Windows XP workstations, servers, laptops). After setting up the management console, deploy agents/clients to these machines for a fair test of how the software will behave in your network. 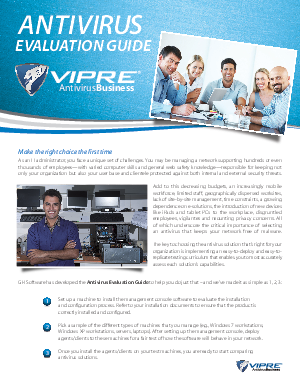 Once you install the agents/clients on your test machines, you are ready to start comparing antivirus solutions.